An Alternative Natural Sweetener Pure maple syrup is made from the sap extracted from certain species of maple trees primarily growing in the northeastern U.S. and Canada. Tapping maples for this clear sweet liquid is a practice originally acquired from various indigenous woodland tribe's native to these regions. The syrup we are explicitly referring to is 100% pure maple syrup, which is nothing but the boiled sap from the maple tree. 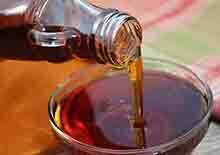 Manufacturers use the word "pure" to make the distinction that maple syrup is the only ingredient.